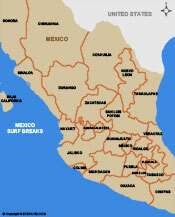 Mexico is considered one of the best places in the world for fishing. The waters in Mexico and off the coast of Baja are teaming with Tuna, Wahoo, Dorado, Cabrilla, Pargo, Sailfish, Marlin and Roosterfish. Boat charters and deep sea fishig trips are available. Charters usually include captain, first mate, gear, bait, and food. 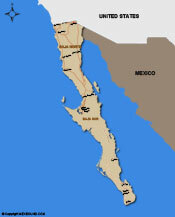 Click on the map below to view either fishing in Baja or Fishing in Mexico information.